What crop does it eat? 1.5. Is maize affected by FAW safe to eat? What is the biology of the insect? How is the Fall Armyworm managed? This is the community page. The Fall Armyworm (FAW) is a major pest in Africa and is now moving across India. While we have good knowledge on dealing with this pest from the Americas, the local situation in Africa and India is different. Therefore, we need a dynamic platform on FAW knowledge. PlantVillage, an established platform with over 8 million visitors and 80-100,000 new/month is opening its FAW page for community editing. For such a rapidly moving, transboundary pest, we need a more rapid sharing mechanism to share knowledge. So, please do edit this page and share you knowledge. People will be also able to ask questions. If we need we can create sub-pages (e.g. FAW biocontrol). Here is a guide to using CK editing. Fall Armyworm (FAW), or Spodoptera frugiperda, is an insect that is native to tropical and subtropical regions of the Americas. In its larva stage, it can cause significant damage to crops, if not well managed. It prefers maize, but can feed on many crops. A recent review by Montezano et al (2018) recorded 353 S. frugiperda larval host plant records belonging to 76 plant families, principally Poaceae (106), Asteraceae (31) and Fabaceae (31). "The literature search revealed 274 (77 % of total) bibliographic records, while 82 (23 %) are new records from surveys in Brazil." These plants, include rice, sorghum, millet, sugarcane, vegetable crops, and cotton. FAW was first detected in Central and Western Africa in early 2016 and has quickly spread across virtually all of Sub-Saharan Africa. Because of trade and the moth’s strong flying ability, it has the potential to spread further. In August 2018 it was confirmed to occur in India. Farmers will need great support through Integrated Pest Management to sustainably manage FAW in their cropping systems. The damage may vary depending on the stage of the crop, insect population, and stage of larvae, etc. Though the damage can be easily identified by characteristic scraping (caused by first- and second-instar larvae) and holes in the leaves (caused by third- to sixth-instar larvae), sometime the leaves may be cut in half, resulting in a reduction of photosynthetic leaf area. The damage gives a ragged appearance to the plant. The larvae are nocturnal in habit. They are active and feed only during the night. They hide in leaf whorls during the daytime. You can scout for the presence of FAW. Access Agriculture has made an excellent video for scouting. A summary video is below. But check out their page for the full video in multiple languages. On this page, our attention is focused on Fall armyworm in Africa which is an invasive species. As mentioned, it also occurs in India. Fall Armyworm is considered a major problem because it causes severe economic loss on major food crops worldwide. Ealier estimates by CABI (CABI 2017) estimated losses of between US$2,481m and US$6,187m per year. A more recent report (29th October 2018), also by CABI, reduced the suggested losses. "The revised estimates indicate that the potential impact of fall armyworm on maize production across 12 major African countries is lower than previously estimated at 4 to 18 million tonnes annually, with an economic value of between US$1 to 4.6 billion per annum." (CABI 2018). FAW is particularly problematic also because it can occur on many important crops besides maize, such as sorghum, rice, and sugarcane. This video is an animation that shows the lifecycle and the sampling scheme that is recommended. What is the difference between Fall Armyworm and African Armyworm? "They are closely related, but have different behaviors and ecologies. FAW rarely displays the "Armyworm" behavior of larvae massing and "marching" across fields. As a native to Africa, the African Armyworm faces a complex of natural biological enemies (predators, parasitoids, diseases). The FAW probably arrived in African unaccompanied by its natural enemies allowing their populations to increase even more unchecked than normal." FAW has a wide host range but at present it becomes a major problem in African continent mainly on corn (maize), rice, sorghum, sugarcane, wheat, and millets. It also prefers to feed on cowpea, peanuts, potato, soybean, and cotton. It is considered a polyphgagous pest meaning it eats many different types of food plant. Is maize affected by FAW safe to eat? FAW originated from tropical and subtropical regions of the Americas (North and South America). It is now a serious pest in West, Central, and Southern Africa and has moved into India. To see a map of the latest confirmed distribution, along with supporting references, view the Fall Armyworm Portal. There are efforts to model the likely distribution. For example, work by members of the FAW R4D community (including Dr. Johnnie van den Berg) have developed models based on CLIMEX. Some of this is shown in this figure. What the authors said based on these work was "Although S. frugiperda has already expanded its range throughout the African continent, it has most likely not yet reached its geographical limits there." You can see the whole paper here on ResearchGate (login required). 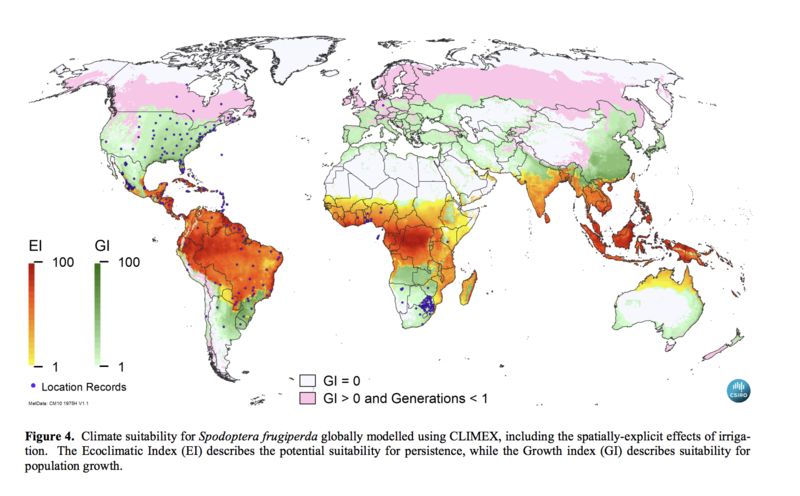 There are other models that use species distribution modelling (SDM). The CLIMEX and SDM give similar, though not identical results. See for example, the paper by Early et al 2018. On this page, we are linking to other pages where we could provide an update on country records. This is something that may be important and the community can decide. Is the current situation going to get worse? The adult female moths of FAW are strong flyers and will continue to spread across the continent, and possibly beyond. Populations of FAW may continue to build, as they find more host plants to multiply on, and in the absence of the complex of natural biological enemies (general predators like ants and earwigs, specialized parasitoids) and a host of entomopathogens (virus, bacteria and fungi). The revisal of loss by CABI in 2018 suggests that the situation is not as bad as in 2017. But we again should be cautious as we still lack data on its abundance. We also don't understand how yield loss relates to damage of the leaves by FAW feeding. Research is needed. Is there an impact on trade? Exports of crops that are host plants for FAW from African countries with confirmed presence of FAW will come under new scrutiny from importing countries that haven't reported FAW. 1. How do I recognize it? Frass: The presence of moist sawdust-like frass (excrement) near the funnel and upper leaves. Figure 1: An example of frass, which indicates the presence of FAW feeding. Larvae: Larvae undergo six developmental stages (called instars). The first and second instar larvae are green in color with a black head. The third to sixth instars larvae are light tan to tan, green in color with white visible stripes on the body. Also, these stages have distinct four dark spots arranged in a square on 8th and 9th abdominal segments. Egg: Eggs are laid in masses. Each mass may contain 100-200 eggs and covered with grayish cottony scales and tiny bristles . Adult moth: Both male and female moths are 30 to 40 mm from wing tip to wing tip. The hind wings of both sexes are white/silver with a narrow dark brown border. The forewing of male moths is having more patterns and a distinct white spot on the outer tip. 2. What is the life cycle? The life cycle of FAW involves an egg, larva, pupa and adult moth. The main destructive stage is a larva. Generally, female moth lays 100-200 eggs in a mass on the lower surface of the leaves, but sometimes can also found on the upper surface. Eggs will hatch in 1 to 3 days. The first- and second-instar larvae feed on corn leaves by scraping the leaf surface. Whereas, the third- to sixth-instar larvae feed on leaves by making elongated holes. The larval stage lasts for 9 to 20 days, after which the mature larvae fall off and burrow into the soil and pupate inside the cocoon. Within 8 to 10 days adult moth will emerge from the pupa. "In the tropics, breeding may be continuous with four to six generations per year, but in the northern regions only one or two generations develop; at lower temperatures, activity, and development cease, and when frost occurs all stages are usually killed. In the United States, S. frugiperda only spends winter in southern Texas and Florida. During mild winters, pupae can survive in more northern locations." 4. How does it spread within a crop and within/between regions? 1. What can be done (by extension, agriculture department, the farmers, etc.)? "There are many experiences and recommendations for managing FAW from the Americas. African farmers will need access to information and resources to sustainably manage FAW." 2. What alternative crops can farmers be advised to grow? "Maize is the most infested now in Africa. As a staple crop, it is unlikely that farmers and their families will want to abandon maize. There are ways managing FAW in maize, as demonstrated in the Americas." 3. Can FAW be eradicated from Africa? "Unfortunately no. 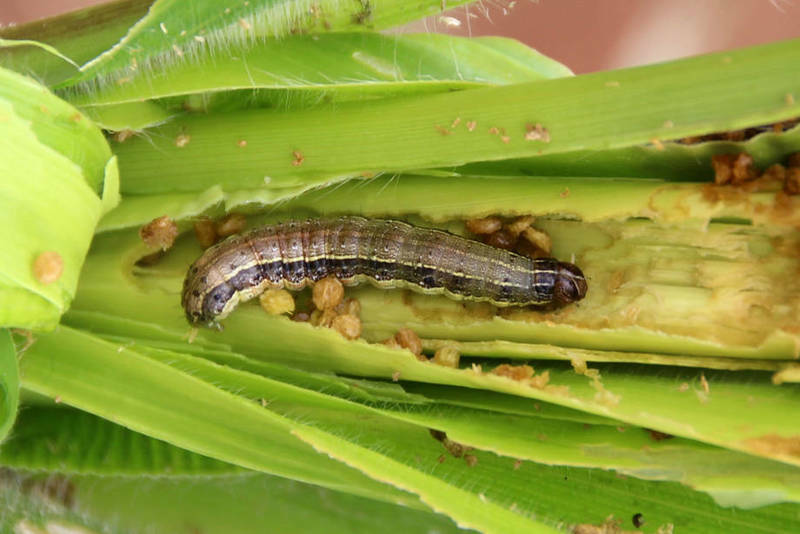 The adult female moth of the Armyworm is a strong flyer and has rapidly spread across Africa, infesting crops (maize has been the most important to date) in probably millions of hectares of crops. It is far too widespread and numerous to be eliminated." 4. If the FAW is native to the Americas, aren't there experiences and practices that can be applied in Africa? "Definitely. There is a wealth of management experience and research from the Americas that can be shared and tried in Africa. FAO is actively promoting South-South cooperation to bring this experience and knowledge to Africa." 5. How can field scouting assist management? Scouting can help to detect fall armyworm infestations before they cause economic damage. So survey the field regularly and look for egg masses, leaf damage and larvae. The best time to look for larvae is early morning or late afternoon. 6. How can scouting be done in the field? "Determine the field to be sampled. For a smallholder, this is typically less than 2 ha. If the fields were planted at different times, with different varieties, or with different conditions (intercropping, fertilization, etc), then each plot should be sampled differently. So in 100 plants, it would be double 26X2 = 52, or 52 percent of the plants infested." 7. What cultural control measures can be taken? 8. Can pesticide be used to control FAW? "Pesticides may be needed to control FAW locally. The most effective, lowest-risk, economical, accessible and easily used by smallholders (without sophisticated machinery) need to be determined within each country and across the continent. It's not just a question of the most effective pesticide in a research station, the specific recommendations (active ingredient, formulation, type and timing of application), and their costs and benefits to smallholder farmers must be determined." 9. Are there effective chemical control measures? 10. When should pesticide applications begin in maize to protect it from FAW? "Only when justifiable. 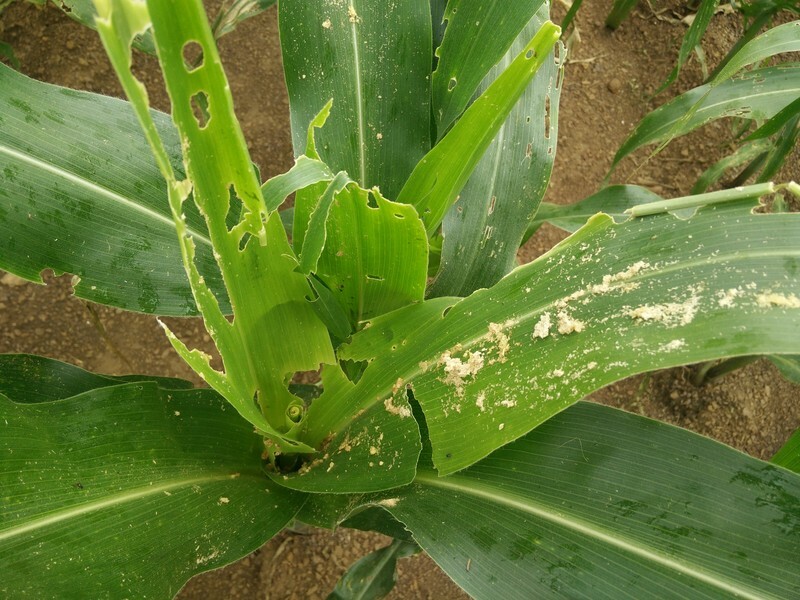 Low levels of infestation at certain stages of maize growth may not cause much yield loss. The economic or action threshold must be determined and recommended for each stage of maize growth and for each type of pesticide and application techniques. Costs can vary tremendously. To economically justify their use, the costs of pesticide use must be equal to or less than the value of the additional yield that farmers receive for taking action. The prices that farmers receive for their harvest must also be correctly valued." 11. Are aerial applications of pesticides recommended for the FAW? "No. The destructive life stage (the larva) digs deep into the whorl of maize occasionally, making the aerial applications of very low efficacy, while spreading pesticides over large areas of non-targeted habitat." 12. How can pheromone traps be used in management? Traps baited with pheromones hold potential for predicting when the FAW infestations develop. So installing pheromone traps in the field help to monitor and kill the adult insects. 13. Is there a role for transgenic maize? 14. Is the use of biological control a possibility for the FAW in Africa? "There are many biological organisms that can help control FAW. Some may be naturally occurring in Africa (general predators, parasitoids and some entomopathogens), and some might need to be introduced from the Americas (specialized parasitoids, predators, and certain strains of entomopathogens). The use of botanicals is also an appealing option." 15. What are the prospects for IPM? "An Integrated Pest Management (IPM) approach is strongly recommended. Reliance on single control methods may, in the long run, either be unsustainable or ineffective and, in the worst cases, increase the likelihood of FAW resistance." CABI have collated pest management resources from a wide range of organisations on the Fall Armyworm Portal. This includes Pest Management Decision Guides for prevention, monitoring and control of fall armyworm on maize and other crops, with country-specific advice for a large number of countries. Access Agriculture has made a nice video showing hor natural enemies can be used. See here. Below is a shortened video but check out their page for the longer video in multiple languages. CABI Invasive Species Compendium. (2017). Spodoptera frugiperda (fall armyworm) datasheet. Available at: https://www.cabi.org/isc/datasheet/29810. [Accessed 4 December 17].